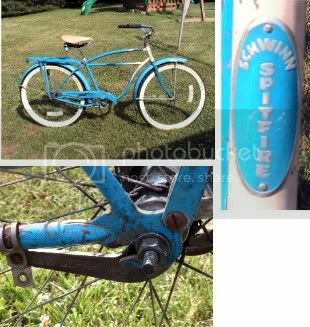 I've got a Schwinn straight bar Hornet with a head badge that that reads Schwinn Spitfire. This was the first Schwinn I've ever seen with that type of head badge, and was wondering if anyone had any information about why these badges were made? The serial number on the bike is S41670, and from what I could see it was made in 1957. There is one more odd feature about this bike, it doesn't have a built in kickstand, and there is no evidence that one was sawn off and then replace with a bolt mounted one. I know that some older Schwinns didn't have built in kickstands, but I thought they were much older than this one. I own a few other balloon tired Schwinns but this is the first one I've ever seen with these characteristics. Any information would be appreciated. Thanks. Serial number location is critical here. Where is it? It's down where the rear axle goes in, on the left side. Here's a picture of it. Maybe that will help. The crank is out of the bike because I'm fixing to clean the bearings. Can someone tell me what year they started making the Schwinn Hornet? Hi, This is the first time that I have used a forum like this. I am new at this and would like to know if anyone can help me. I just got a Schwinn Speedster. If I read the serial number right, it is a 1953. (J059240) I would like to know what helpful cleaning tips you can give me in the way of cleaning, getting chrome clean, cleaning chain, and painting ideas. Any information would be appreciated. one lone plastic and aluminum reflector on the rear fender. Bendix red stripe coaster brake rear hub marked BENDIX usa. My guess is late 60s.Anyone have an idea? I clicked on the serial# chart, and the closest I could come to your serial would be 1958: the 1st '0' should be a 'D' followed by six digits according to what I saw on the chart; doublecheck it to make sure and go to the chart to check it out. Good luck!